Samuel Watts the elder was born in 1734 although the whereabouts of his birth are unknown. On 13 February 1764 he married Mary Bullock from the wealthy family of Yeovil landowners. Samuel and Mary were to have five sons; George Bullock (1772-1837), Samuel the younger (1774-1843), Edward Bullock (1785-1849), Joseph (1786-1828, Calcutta, India), Thomas Bullock (b 1787) and four daughters; Winifred (b 1780), Mary (who married James Glyde), Grace (married James Cayme the Younger in January 1806) and Hannah (who remained unmarried) whose dates are unknown. 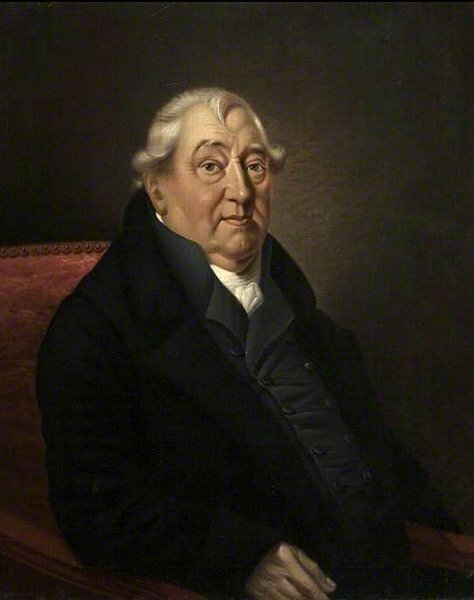 Of his sons, Samuel the younger, Joseph and Thomas Bullock all became solicitors, Edward Bullock was a Land Surveyor and Land Valuer who became the Town Surveyor of Yeovil, while George was a butcher and Churchwarden of St John's church between 1802 and 1813 - an exceptionally long term - and caused considerable upset. Thomas Bullock Watts was also a wine merchant and a partnership was formed and noted in the London Gazette that the partnership traded under the name Cayme Watts & Co. Those signing off on a new name were Thomas and Edward and Thomas' brother-in-law James Cayme the younger and his brother John Cayme. However Cayme, Watts & Co was dissolved on 27 July 1813. At this juncture Edward Watts wanted out (he had just married and had even left the military volunteers). In 1815 there was an interesting bankruptcy reported for a certain carpenter named John Nossiter whose creditors included maltsters from as far away as Bristol and the Yeovil brandy merchants, Bullock, Watts & Cayme the Younger. Indeed James Cayme and Thomas Bullock Watts were themselves declared bankrupt in October 1822. Nevertheless, it would seem that the venture was continued by the firm of Thomas Bullock Watts & Co which was listed in Pigot's Directory of 1824 as a 'Wine & Spirits Dealer' of Wine Street although Thomas was again declared bankrupt in December 1824. In 1767, at the age of 33, Samuel Watts took up a five-year clerkship with William Stuckey, a solicitor of Eastover, Langport and connected with the banking firm of Stuckey's. At this time, of course, the majority of solicitors were also engaged in a variety of commercial activities such as banking, insurance and real estate. In a deed dated 1774 Samuel took out a lease on a property in Vicarage Street and was mentioned in a similar lease on a Vicarage Street property in 1803. He was listed as an attorney of Yeovil in Bailey's Directory of 1784. The Universal British Directory of 1791 listed Samuel Watts as one of the four Yeovil solicitors, the others being Edmund Batten, George Proctor Upton and William Lambert White. The banking firm of Messrs. Watts, Marsh, Bullock & Co. that became Samuel Watts & Co. was established in the lifetime of Samuel Watts the Elder, but probably too late for his active participation although Yeovil Bank was a private bank established by Yeovil attorney Samuel Watts the Elder. The bank was probably founded around 1810 and was certainly active during the early 1820s. A reference in the London Gazette in 1812 has it Watts Marsh & Co. (Samuel the elder's sons Samuel and Joseph Watts and Thomas Marsh). The Nossiter bankruptcy of 1815 has as one of his creditors Messrs Watts Marsh & Bullock & Co. Later in 1815 it was announced that this banking partnership was dissolved by mutual consent under the signatures of Samuel Watts the Younger, Thomas Marsh, Thomas Bullock, and James Glyde. Daniel Vickery, writing in 1856, referred to Yeovil's third bank as Samuel Joseph Watts and Cayme. By 1822 (Pigot's Directory) it had become Samuel Watts & Co. It would then have gone out of business on 8 November 1823, when Samuel Watts the Younger, scrivener and banker, was declared bankrupt. Samuel died in 1820, aged 86, and was buried at St John's on 3 February 1820. 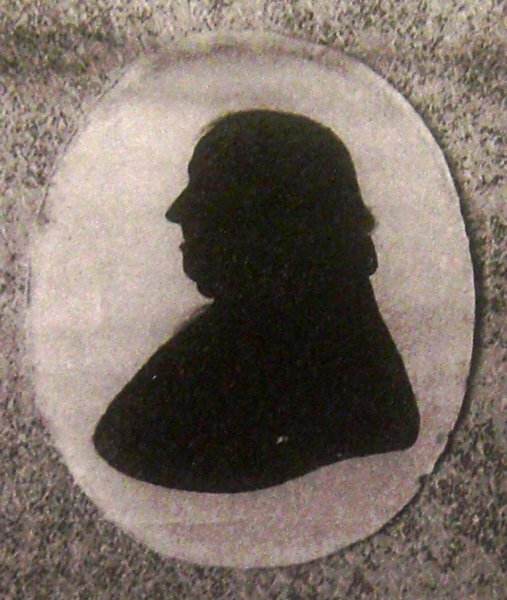 A silhouette of Samuel Watts. On the back is written "Samuel Watts, solicitor, Yeovil, Somerset. Taken when he was about 80 years. Died 1820, aged 86"
According to the BBC website this portrait is of Samuel Watts (1774-1843) - that is, Samuel Watts the younger. However, compared with the silhouette above and the portrait of the younger Watts here, I am convinced that the above portrait is of Samuel Watts the elder. The 1820 entry of Samuel Watts Snr's burial in the register of St John's church.